Original Antique WW1. Packaged Wt. 140g. Mister Sidney Low the British journalist and writer. A Gun Trench on the Balkan Front: A Row of Smiling Face. Bad Landing: An Aeroplane in a Trench. 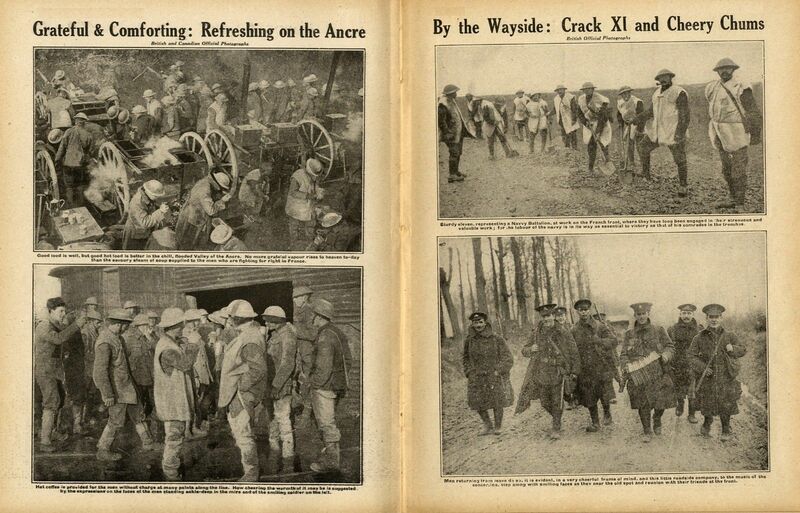 On the Somme Front: Off Duty Men Chatting With Their Comrades of the ASC as the Transport Columns Pass Along. Canadian Artillery: Heavy Howitzer Gun Being Loaded into Action of the Somme. 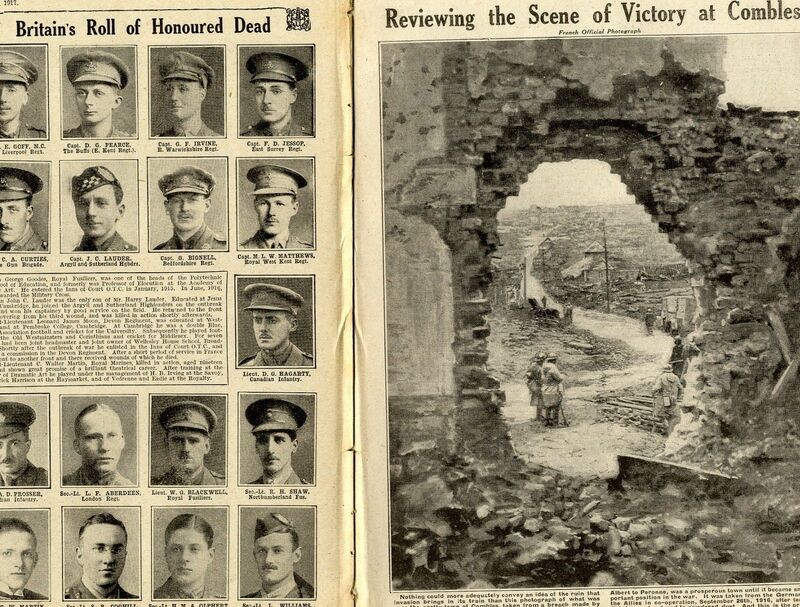 Victor of the Somme: General Sir H. S. Rawlinson - full page. Russian Soldiers: A Priest Using a Gun Limber as An Improvised Alter in a Snowy Landscape. On the British Front: A Padre Brings Comfort and Uplifting Words to The Troops. British Soldiers Smile as they Pass Along a Wintry Road On Their Way to the Front Trenches. British Soldiers Wearing Weather Proof Tempere and Water Proof Waders in a Muddy Part of the Somme Battlefield. British Troops Going up to the Trenches. Scraping the Worst of a Donkey After Being Bogged inthe Mud. A Youthful British Soldier with Cigarette Between Fingers, Among the Icicles That Hang in His Dug Out. A Trench Howitzer About to Be Fired on the Balkan Front. Nine Points of the Law of Tenancy: Smiling British Soldiers in a Captured German Dug Out with a Sign Saying "Durchang Verboten". A Field Kitchen: Men Queuing for Hot Food. A Navvy Battalion at Work on the French Front. Men Returning From Leave - Eight Men Walking Along A Road Accompanied by the Music of a Concertina. An Airmans View of the Somme Battlefield - full page photograph taken by a French aviator at a height of about five hundred feet. A Gas Attack on the Somme Battlefield Seen from the Air - a double page photograph showing a serpentine of trenches, the ground scarred by shell holes, man leaving their trenches etc. British and French Troops Take Over More Line on the Somme. The French Submarine Carrier Kangaroo, Torpedoed and Sunk in the Bay of Funchal, Showing The "Pouch" in Her Forward Part - before the sinking; info SS KANGUROO a French heavy-lift ship built to transport submarines. Interior View of a Submarine. c.keenlyside. A Submarine in Position on Board the French Sub Carrier Kangaroo. Inside a Submarine Looking Through the Periscope. British Navy on the Deck of an Intercepted Vessel. German Blockade Runners Seek Black Assistance - "Dejected Darkies Do Not Seem to Have Relished the Taste of Adventure......"
Somme near Maurepas: A German Shelter Shattered from a Shot from the Allies Artillery. Near Bouchavesnes: Enemy Gun Shelter Made of Timber Balks and Rails. Testing Hunnish Tools: A Poilu Soldier Tries a Flame Thrower. German Prisoners Taken by the French in Their Ofensive Before Verdun. Soldier Smoking His Pipe During a Brief Rest with Shell Cases and Ammunition Baskets in the Foreground. Near Bouchavesnes: Gun Emplacement of Enemy Battery of "77's" - Abandoned Helmets Show a Rapid Retreat. Before Verdun - Heavy German Guns in a Crater. German Prisoners After the Reive Taking of Vaux Fort. French Soldiers Watching German Prisoners Taken During the Verdun Offensive. Enemy Patrol Secured on the Verdun Front - One Poilu Guarding Them, Note the New Helmet Adopted by the Germans. Boches from Before Verdun Safely Encaged - A Wounded Officer in the Foreground. Combles Railway Station Showing the Debris of an Enemy Munition Train. Train Engine Left Behind by the Germans When They Fled From Combles. Combles Station a Gutted Ruin. Aerial Photography - A Nieuporot Chaser Biplane at a Height of 6000 Feet Taken from Another Nieuport. An Imaginative German Artist's Conception of an Engagement on the Ypres Canal. Lieutenant Colonel C. E. Goff MC - Kings Liverpool Regiment. Captain D. G. Pearce - The Buffs (East Kent Regiment). Captain G. F. Irvine - Royal Warwickshire Regiment. Captain F. D. Jessop - East Surrey Regiment. Captain George Goodes MC - Royal Fusiliers. Captain L. C. A. Curties - Machine Gun Brigade. Captain G. Bignell - Bedfordshire Regiment. Captain M. L. W. Matthews - Royal West Kent Regiment. Captain H. P. Meakin - Coldstream Guards. Lieutenant D. G. Hagarty - Canadian Infantry. Second Lieutenant Leonard James Moon - Devon Regiment. Lieutenant A. D. Prosser - Canadian Infantry. Second Lieutenant L. F. Aberdeen - London Regiment. Lieutenant W. G. Blackwell - Royal Fusiliers. Second Lieutenant R. H. Shaw - Northumberland Fusiliers. Second Lieutenant J. M. Underwood RFA. Second Lieutenant C. Walter Martin Aged 19 - Royal Marines. Second Lieutenant S. B. Coghill - Royal Inniskilling Fusiliers. Second Lieutenant H. M. A. Olphert - R. Munster Fusiliers, Attch. Leinster. Second Lieutenant L. Williams - Northumberland Fusiliers. Article on the Naval Airmen; Seaplanes hunting u-boats etc. subtitled: Their Special Front - - Landing Dangers - - Night Experiences - Zeppelins. 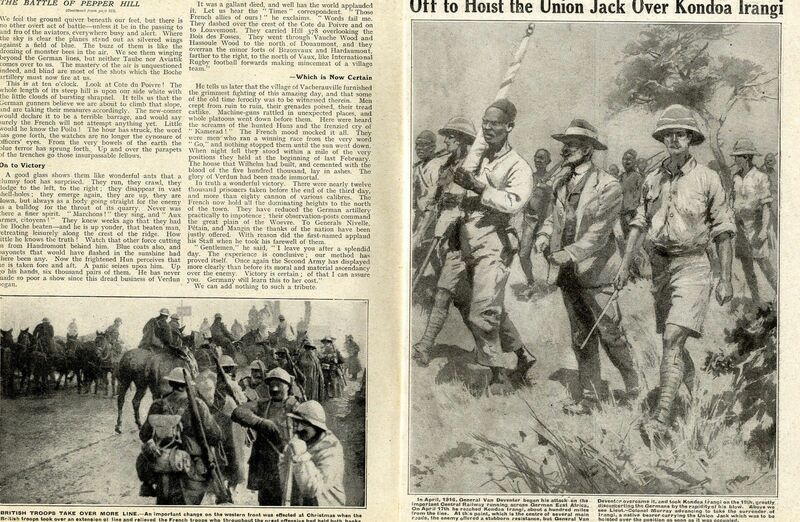 An article on The Battle of Verdun, (Bataille de Verdun - Schlacht um Verdun) which refers to La Cote du Poivre or Pepper Hill - Lord Northcliffe - Douaumont - Haudromont Quarries - Vauche Wood - Hill 378 - Vacherauville - Louvemont - Hassoule Wood - Vaux - etc. List of events, battles etc during the month. sleekburnc.